HP Spectre Folio is the World's first leather convertible PC. HP today unveiled the Spectre Folio, the world's first leather convertible PC and also the world's first gigabit class LTE Intel based laptop. For customers activating the device on the Sprint network, Intel and Sprint are offering free unlimited data for six months with Autopay. HP Spectre Folio, the world's first leather convertible PC, comes with a durable material that provides a natural hinge and flexible chassis to enable a breakthrough new form factor. The 100 percent chromed tan, full-grain leather from which the device is made plays an important functional role. The Spectre Folio will be available in two colors: Cognac Brown and Bordeaux Burgundy. With one hand, the thin and light device moves effortlessly from a traditional laptop position typically used for productivity, to tent position that neatly tucks away the keyboard for sturdier support on the lap, to tablet position with a built-in tilt for intuitive inking - all made possible by strategically placed magnets and the unique flexibility of leather to act as a natural hinge. To achieve a thin and light design in this radically new form factor, the Spectre Folio incorporates one of the smallest motherboards in the industry. It is powered by 8th Gen Intel Core i5 and i7 (Y-series) processors. Additionally, an innovative fanless thermal design leverages the unique qualities of leather to create an experience that feels both cool and comfortable in the lap. HP also worked closely with the renowned global audio and lifestyle brand Bang & Olufsen to expertly tune the four front facing speakers for a superb audio experience in any of the device positions. Other features include up to 16 GB of memory, up to 2 TB of SSD storage, and either a 300-nits FHD display or a low-power, 1W 400-nits FHD option for ideal viewing in any lighting condition. A 4K UHD display panel option will be available later this year. HP's Spectre Folio comes with up to 18 hours of battery life. The Spectre Folio is the world's first gigabit class LTE Intel based laptop, providing an Always Connected PC experience that is more secure than traditional public Wi-Fi hot spots. The device also supports dual eSIM, with an optional nano-SIM slot under the display and an optional embedded digital eSIM to easily and quickly connect to their cellular networks for blazing fast Internet and data. For customers activating the device on the Sprint network, Intel and Sprint are offering free unlimited data for six months with Autopay. The HP Spectre Folio is expected to be available in Cognac Brown with an Intel Core i7 processor at select Best Buy retail locations and BestBuy.com beginning October 29. 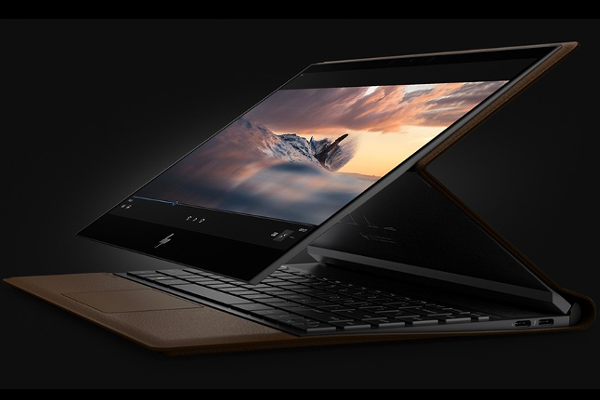 The HP Spectre Folio is expected to be available at HP.com in Cognac Brown with an Intel Core i5 processor for a starting price of $1,299.99. The HP Spectre Folio is expected to be available at HP.com in Cognac Brown with an Intel Core i7 processor and LTE for a starting price of $1,499.99.